When running a raffle, you often sell tickets in booklets of 5 or 10 tickets. It is nice to have the numbers in these booklets running in consecutive order. So you have one booklet with ticket numbers 101-120, the next one 121-130 and so on. This sketch shows four sheets of paper, each sheet having four tickets. If you stack the paper and cut off the top tickets to make a booklet, you'll end up with tickets 1,5,9 and 13 in that booklet. But you wanted tickets 1,2,3 and 4. So your first sheet of paper has tickets 1,5,9,13, the next sheet has 2,6,10,14, and so on, which looks odd when you print it, but when you then stack the paper and cut the whole stack, you will have booklets of four tickets each with consecutive numbers. The exact order you need will depend on how many tickets you want in each booklet. That sketch shows the numbering for four tickets per booklet. 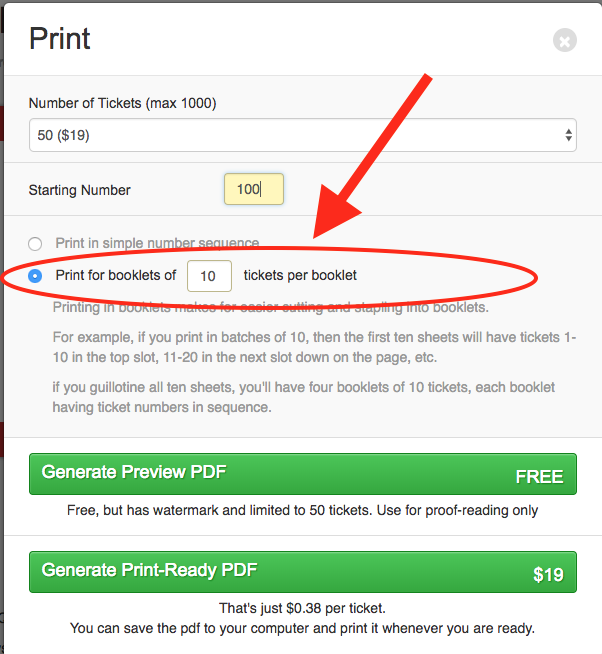 But if you wanted ten tickets per booklet, then you'd need the first page to have 1,11,21,31, then the second page to have 2,12,22,32, and so on until your tenth page has tickets 20,30,40,50.